From 12 to 14 June 2017, students and researchers of iREx participated to the Center for research in astrophysics of Quebec (CRAQ) Summer school. The school takes place every year with a new theme. It is intended for astronomy and astrophysics graduate students, as well as senior undergraduate students in physics. This year, the theme was « Exoplanet atmospheres ». More than 50 students both from Quebec and everywhere around the world attended the lectures given by local and international experts. The first day took place at the Planétarium Rio Tinto in Montréal. In the morning, the employees of the planetarium joined the students to attend to the lecture « Exoplanet 101 », given by René Doyon and David Lafrenière, both professors at Université de Montréal and iREx researchers. A brief overview of the state of current research on exoplanets, detection methods, exoplanet types and basic physics governing exoplanets were presented. Nicolas Cowan, who is also an iREx researcher and professor at McGill University, presented the afternoon session. He talked about the basic concepts associated to the atmospheres of exoplanets and simple energy balance models. David Lafrenière of iREx explaining the concept of equilibrium temperature to the participants and employees of the Planetarium on the first day of the school. Tuesday, at Université de Montréal, the students first attended the course of Eliza Kempton (Grinnell College). She presented the basis of radiative transfer, as well as the physical principles that influence star light transmitted through the atmosphere of an exoplanet. In the afternoon, Yi Huang, from McGill’s Department of Atmospheric and Oceanic Sciences, gave an advanced lecture on the impact of clouds in the atmosphere of a planet like the Earth. During the third and last day, Michael Line (Arizona State University) gave the students the opportunity to experiment with a computer code that simulates the atmosphere of an exoplanet. In the afternoon, Nikole Lewis (Space Telescope Science Institute) discussed the various physical phenomena present in the atmosphere of the Earth, with an emphasis on atmospheric circulation. She then showed how these phenomena can also appear in the atmosphere of Hot Jupiter exoplanets. 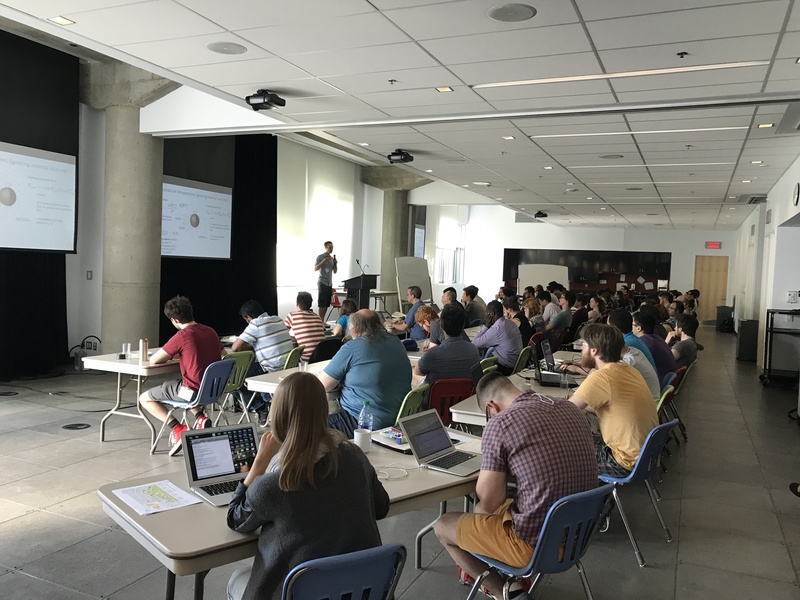 Many iREx students then attended the summer workshop organized by the Technologies for Exo-Planetary Science (TEPS) CREATE program, again, at Université de Montréal, from 15 to 17 June. A few dozens of students and researchers from all TEPS partner universities were present. A public talk intitled “Rocks, Ice and Penguins” was presented on the evening of 15 June by Ray Jayawardhana, professor at York University. He talked about his trip to Antarctica to collect meteorites, and how this experience enriched his life as a researcher specialized in the study of exoplanets.